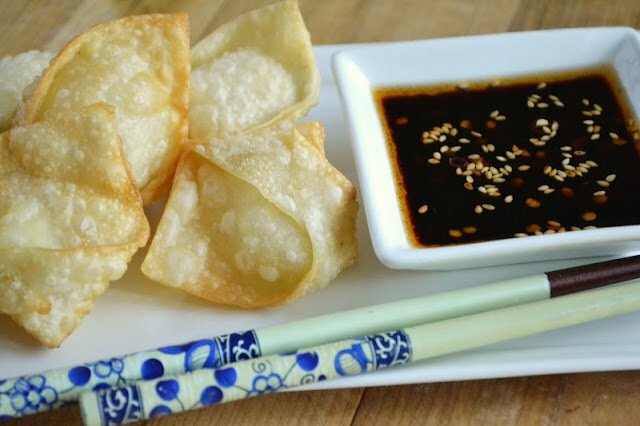 Crispy Goat Cheese Wontons with Chili Dipping Sauce ~ crunchy little wontons filled with creamy goat cheese ~ this is the appetizer everybody goes wild for! Heat two inches of oil in a 2 qt saucepan to about 350 degrees. Put a small dab of goat cheese in the center of each wonton wrapper. Run a wet finger around the edge and fold the wonton in half diagonally. Press with your fingers to seal the dough. Bring the two outer corners up and overlap them, sealing with a bit of water. You can also leave the wontons in a triangle shape, if you prefer. Drop the wontons in the hot oil and let fry for about a minute to a minute and a half, just until they are golden and crispy. Flip them halfway through. Drain on a paper towel.